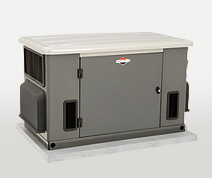 Briggs & Stratton is proud to offer the new enpower series 20KW Home Generator System. This system offers whole house comfort & control in an extremely compact and affordable package. The standard 20kw package will supply enough automatic backup power to manage two 5-ton AC units, and the optional High Efficiency upgrade optimizes the system that provides enough energy efficient power for even the most power-hungry homes.